Growing up, my mother’s jewelry box was off limits to little girls. Well, with four of them you can imagine the fascination with jewelry. I can remember standing on my tippy-toes, tippy-toes just to get a little glance of what was inside that big box on her dresser. On those special occasions when her and my father were going out for the evening, she would set it on the bed for us to look through. There were all sorts of beautiful things; rings and necklaces; earrings, bracelets and pins. She only wore them on very special occasions and I guess that’s they were so special to us as well. I remember a big banquet that they were attending for my father’s work. She raised and ran a house of four girls during the day and at night, she sewed her own gown and cape to match. (It was the late 60’s and cape’s were the high fashion.) We all waited at the bottom of the stairs and watched as she seemed to float down them. Everything was perfect, from her head to her toes and she smelled wonderful. I remember watching my father put her cape on her shoulders and with one last kiss to each of us, they seemed to dance right out the door. Funny; I was helping her do some work at their house just last week; you know, she still has that cape in plastic, hanging in the closet. Some things are just too special to let go of. I love these pearls! The sheen on them is so beautiful. Fantastic shot. These remind me of my grandmother, who was always so well-dressed. Great pic and thanks for the memories. This is a beautiful shot and I love what you wrote.... touched my heart and brought up wonderful memories of my mother. She has been gone since 1979, but memories really do fill your heart. The shot and wonderful story compliment each other perfectly. Love them both. Love the story behind this shot -- gorgeous capture too! Wonderful story. I love the color of this photo. 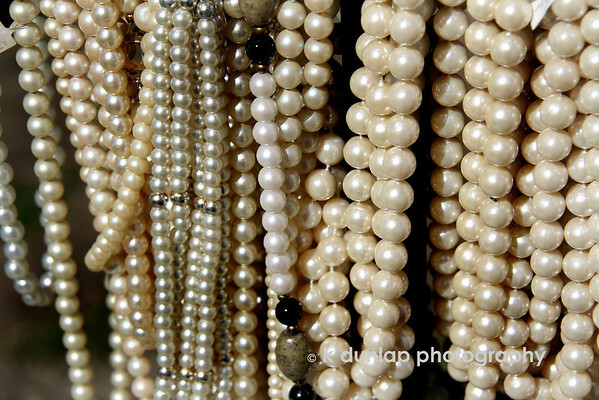 Lovely shot of the pearls. I had similar experiences with my mother. Beautiful shot. I really have appreciated your mother series.